When the A’s and the Giants play… everybody loses. With the first weekend of Interleague Play, baseball fans around the nation have been enjoying new and classic rivalries, pitting brother against brother in classic Civil War style. 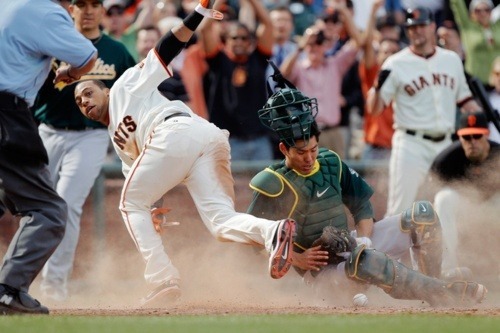 At this time of year though, the A’s/Giants matchup makes me cringe. I was born and raised in Albany, CA, a small, one-square-mile town in the East Bay surrounded by Berkeley on three sides. My parents are from New York, and had come to California separately to attend Stanford, before moving to Albany for its excellent public school system. My dad grew up in Brooklyn, and was a die-hard Dodgers fan until they abandoned their fan base and moved west in 1958, when he became a Yankees fan. Moving to the West Coast, his love for baseball was re-kindled years later. Living in the Bay Area, we watched most A’s and Giants game during the season, and lived and died with both teams. We watched the growth and development of Mulder, Hudson and Zito, the Big Three, and we watched Mark McGwire and Barry Bonds thrill with the long ball. We watched Jason Giambi grow his hair out, then turn Yankee traitor and cut it all off. We were good fans… of both teams. I understand the theory behind Interleague Play, and in general I’m a fan of anything that can get people excited about good local baseball. I’m tired of the national media emphasizing the Yankees/Red Sox matches and other “storied” franchises, with scant mention of the rest, so it’s up to the local fans to show our teams the respect that they need and deserve. I support people getting interested in rooting on their local teams, building a community of supporters and actually getting out to the ballpark. I just can’t stand watching the A’s and the Giants play each other. While a lot of people on both sides of the Bay get excited about this series, I dread it every year. I’m definitely more of a Giants fan at this point, but I still watch the A’s and want them to succeed… something that doesn’t jive well with my desire to have every Giants hitter knock one out of the park. Before the season Trevor Cahill was one of my favorites to win the AL Cy Young, but when he faces the Giants… he must fail. For a fan like me, who tries to watch every pitch and every play and understand the repercussions and effects of them all, watching my two teams play each other is, well, torture. I want them both to win. I’m just afraid that a World Series between the Giants and the A’s might kill me. Article first published as I Don’t Hate Interleague Play, I Just Hate the Bay Bridge Series on Technorati.